Amphibian Abstracts: STEM for Everyone! My comics this week take a (hopefully) humorous look at a very serious problem. In STEM (Science, Technology, Engineering, and Mathematics) careers there is a very pronounced diversity problem. Women, who make up roughly half of the general population, do not have anywhere close to that level of representation amongst software engineers, the type of engineers with which I have the most familiarity. So if you weren't aware of this, look at these statistics on technology company diversity: Diversity in Tech. You can find lots more information like that with a quick search. Me and my daughter Alex. 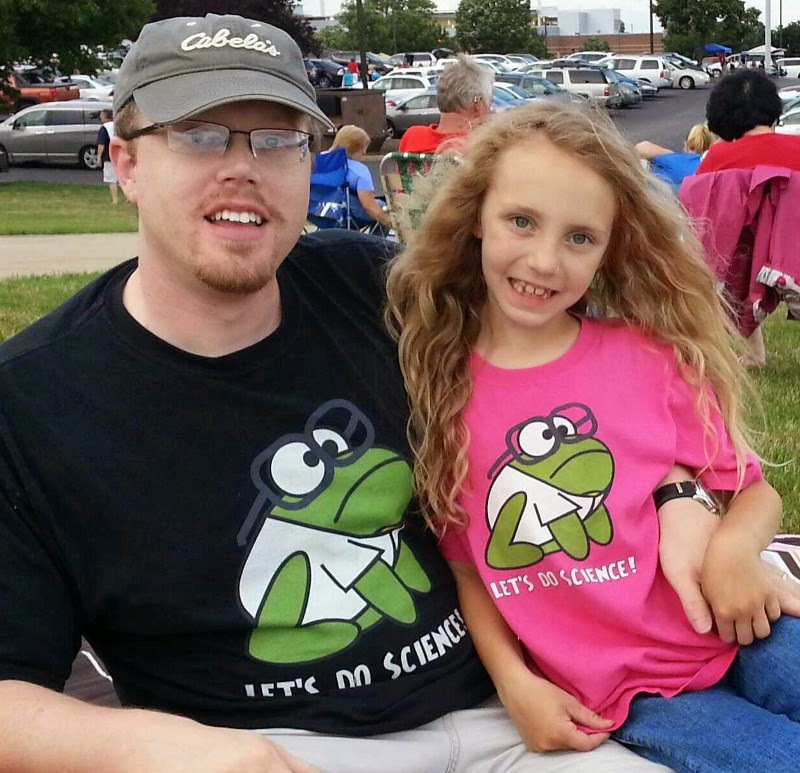 She loves frogs and science. As my frogs search for the cause of their diversity problem, I'm trying to highlight the fact that there seems to be no good explanation of why so few women choose STEM careers. And there are plenty of people who try to explain it. All the time. One day not long ago I saw 3 links to articles in my Twitter feed, each offering a thorough analysis of why software engineering is dominated by men. One provided a great deal of evidence that it is the environment, meaning that current software engineering teams are filled with people who are hostile towards women. Another completely refuted the "environment" theory, insisting that the "pipeline" is to blame. Obviously, the author argued, our high schools and universities do a poor job of getting young women interested in science and engineering careers. The third article presented a balanced argument, which blamed both. Here's an article that claims to have the explanation: The Shortage of Women in STEM Explained. Or maybe this one: Paving The Way For More Women in STEM. Have more time? Read this one: Why Are There Still So Few Women in Science? These aren't even the articles that I read originally - there are tons of writings on this subject in recent years. And so this week's set of comics was written. Everyone has a theory, but nobody really knows where the problem is. Environment? Pipeline? Both? Something else? I certainly don't know, and I wouldn't expect the frogs to figure it out either. I can offer only the following thoughts. My daughter worked on learning Python on her Raspberry Pi for a few weeks, but lost interest. She told me that programming was too lonely. It was just her and the computer. This was a very strange concept for me. One of the things I liked best about programming when I was 10 years old was that it was just me and the computer. I enjoyed the solitude. But in the real world, software development is almost always a team effort. Today I spend much more time interacting with other people than I spend alone with the computer. If someone had explained that to me 25 years ago, I might have picked a different career. If I can explain that to my daughter now, she might again consider it as a career. She is currently planning on becoming an architect, another career I had considered for myself when I was her age. But for all I know, architecture is a lonely career (I don't know any architects to ask). And does her desire to pick a career that involves lots of teamwork have anything to do with her gender? I have no idea about that either. She's just a kid who loves to build houses out of giant cardboard boxes, play with Legos, and stack endless cubes of whatever in Minecraft. If picking a career that involves lots of human interaction is correlated with gender, do misconceptions of what STEM careers are actually like contribute to lack of interest among women? Again, I have no clue. Am I even asking the right kinds of questions? I pretty much don't know anything. But I'd like to know more. I'd like to live in a world where women have equal representation in all careers. Does anyone know how we get there? At least we're talking about it. Keep talking about it, and eventually we'll get it.